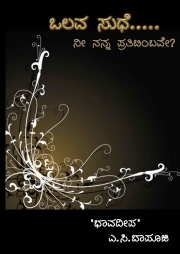 Description of "Olava Sudhe "
Olava Sudhe, is the continued version of Olava Maatugalu. Olava maatugalu was the feelings of a heart who wants to discover LOVE, but Olava Sudhe is the bunch of feelings of a LOVING Heart..... the book has a good collections of Melodious songs depicting love, Nature and care.... Once again, Nature has played an Important Role, in charting this Collections.... thanks to MOTHER NATURE once again.......!!!!!! Nothing great to Explain,,,,,,,, a dreamer and merchant of feelings entasked to distribute LOVE and Feelings among the broken , to be broken, and will be broken hearts .........!!!!!!! Reviews of "Olava Sudhe "